For certain cyclists, the announcement that Rapha is finally making helmets was a cause for great celebration. In the 12 years since Rapha was founded by Simon Mottram, riders have gradually built up the full repertoire of Rapha gear - jersey, bib shorts, socks, overshoes, gloves, shoes, luggage, sunglasses, shaving cream and even a coffee tamper - but have not been able to complete their riding outfit with a Rapha helmet. My guess is that a Rapha helmet has always been in the pipeline but the additional health and safety requirements around helmets probably made it a lot more difficult to manufacture and also pushed the cost up considerably. As Rapha did with their original cycle shoes in 2011, they have teamed up with Giro to deliver the Rapha helmets. The helmets are available in three colours - black, white and chartreuse - and retail at $270. There is an additional Rapha Cycling Club helmet which is only available to the roughly 5,000 RCC members worldwide. 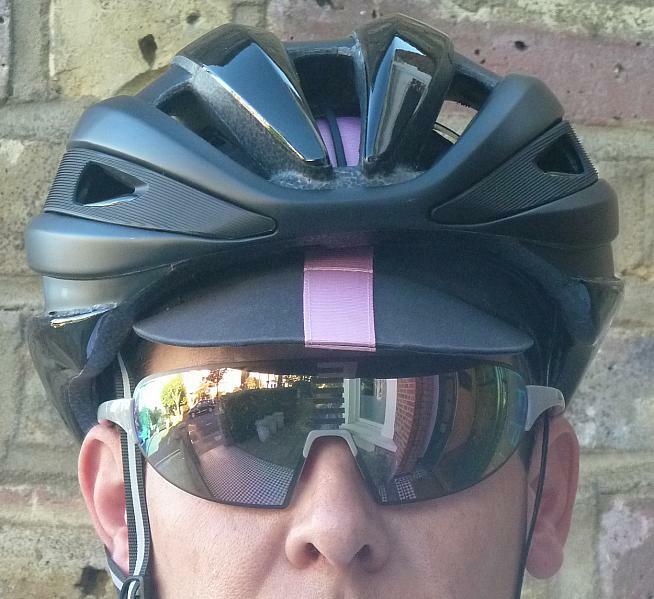 I have to confess that I was also excited to test the Rapha helmet and I requested my review helmet in black, as that feels to me like the core Rapha stylistic sensibility (all their earliest gear was mainly black and it's hard to go wrong with black in any cycling scenario). Fortunately the only three left for review were in the large size (it comes in small - 51cm to 55cm - medium - 55cm to 59cm and large - 59cm to 63cm) as I have a big head, as the editor of Granfondo.com regularly points out. 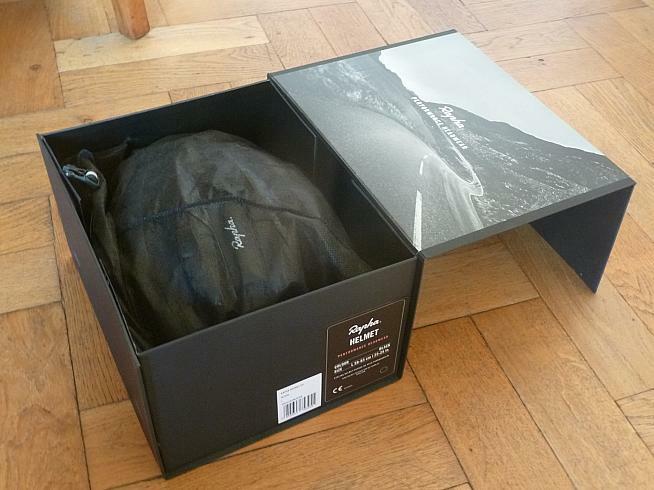 The helmet came in the usual stylish Rapha packaging, a large black box with 'performance headwear' subtly written on it and a helmet wrapped in a cloth bag that certainly feels a lot more classy than the clunky cardboard boxes that most helmets I have tried turn up in. The first thing I noticed when lifting it out of the box is that it is exceptionally light. 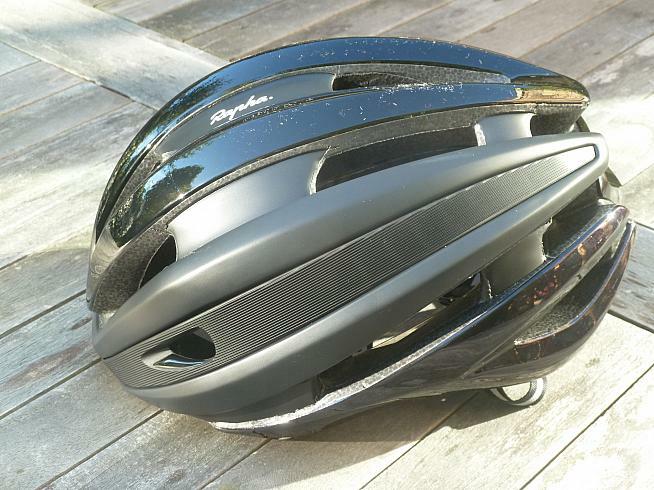 It weighs in at 254 grams, which is about 55 grams lighter than my usual Catlike helmet that I use for long rides. The other thing is that the Rapha branding is really quite understated with just a small logo on the top of the helmet and no other distinguishing features that scream out 'Rapha' to other riders. I guess this may be a negative for some people but I thought it was a good thing. Like all helmets there is a good deal of marketing speak about what it offers the rider. Rapha tells that us "the sophisticated Roc Loc® Air fit-system makes the helmet feel barely there, and additional protection comes from the MIPS Brain Protection System, a low-friction layer between the outer shell and liner of the helmet. It has 17 external vents with internal channelling for superior cooling and the MIPS (Multi-Directional Impact Protection System) reduces rotational forces on impact." I've encountered MIPS in ski helmets before - I have a hairline fracture of the skull thanks to not wearing a helmet when skiing at full speed the Womens' Olympic Downhill course at Sestriere, so it's something I pay attention to - and while it won't be much use if a car hits you at 50mph, it definitely will help reduce injury from certain types of fall. If you want to know more, have a look at the Giro MIPS information page. 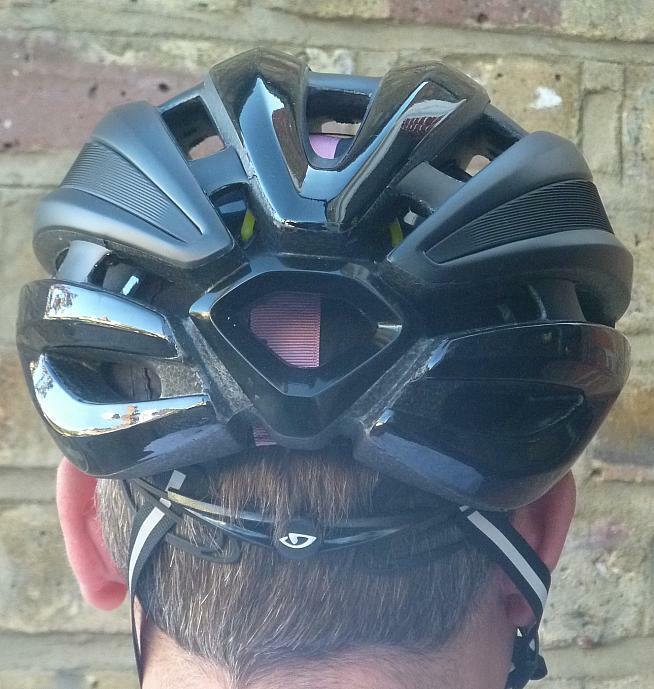 I tested the Rapha helmet on two rides. The first was a brief 25-mile spin around Regents Park in London on a Friday morning on what was originally called the Rapha Ride, which pre-dates the cycling club by some years and still sees Simon Mottram turn up when he's not launching a new project in Chicago or South Korea. Apparently Simon had turned up the previous week wearing his RCC helmet and that had excited some comment, but no-one noticed it as a Rapha helmet when I was riding and only two people commented when we stopped for a coffee (and one of them was Simon himself, who had turned up to join the ride just as we were stopping). The next day I tested it more thoroughly on a 65-mile ride from London to Cambridgeshire. Over the course of four hours riding, the best thing I can say is that I didn't really notice it was there. 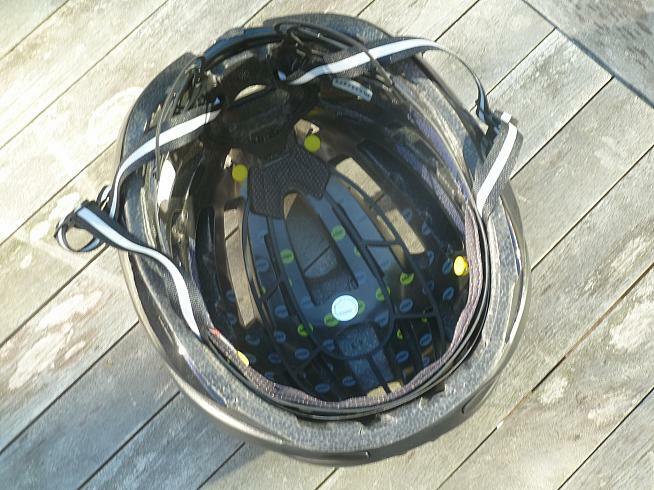 It was a very comfortable helmet and has plenty of vents for breathability. I like the reflective details in the straps as the first hour of the ride was in fog, but it is not obvious they are there and it has no negative effect on the aesthetics. The dedicated ports in the helmet for putting your sunglasses is a nice touch too. The inside has relatively little padding meaning less to fall off. Obviously the helmet isn't the cheapest on the market but it is stylish and understated and given the average helmet lasts for up to five years and you get a lot of use from it, on an annualised basis it's not bad at all, especially given the added safety features. But you don't need to take my word for it - I checked on the Rapha website midway through this review and only a Small was available. Restocks are on the way by the end of the month but it suggests there are plenty of people out there who were eagerly awaiting the Rapha helmet launch.